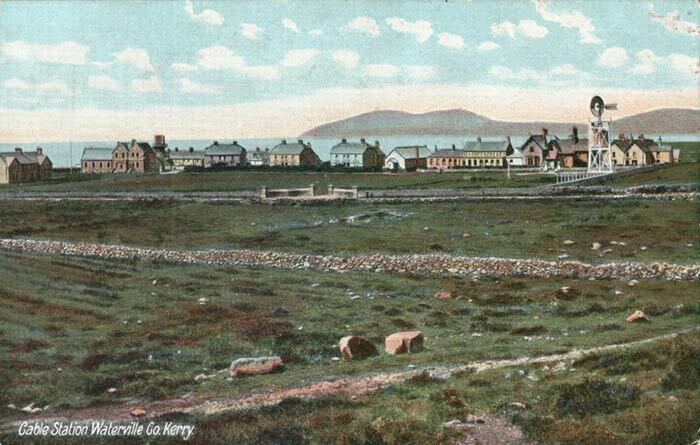 The Iveragh Peninsula in County Kerry, on the southwest coast of Ireland, is one of the most important areas in the world for cable history—the starting point of many Atlantic telegraph cables, from the first attempts in 1857 and 1858 and the first successful cables of 1866, through the rapid expansion on the route in the 1870-1900 period, all the way to the end of the Atlantic telegraph cable era in the 1960s. 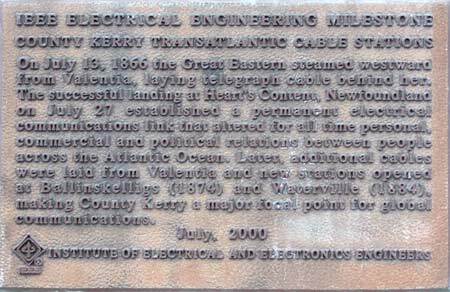 The area was recognized in 2000 by the Institute of Electrical and Electronic Engineers as an IEEE Milestone in Electrical Engineering, and this is commemorated by plaques at the appropriate locations. 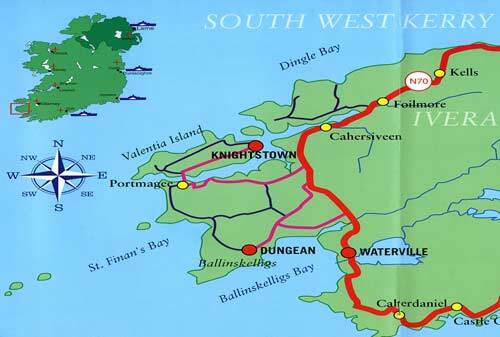 There are three major cable station sites within a few miles of each other on the peninsula; Valentia Island, Ballinskelligs, and Waterville. Little remains of the buildings at Ballinskelligs, but both Waterville and Valentia retain many of the original cable station buildings, and Valentia has a Heritage Centre with a room devoted to cable history. 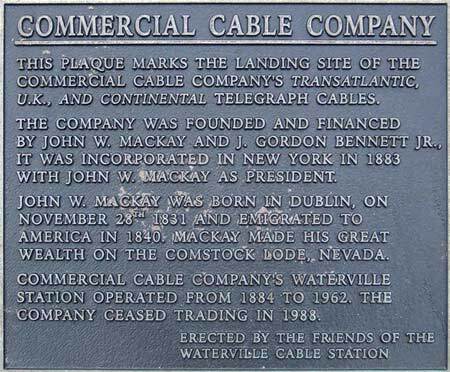 For an Irish perspective on the cable industry in Ireland, see Cornelia Connolly's paper. 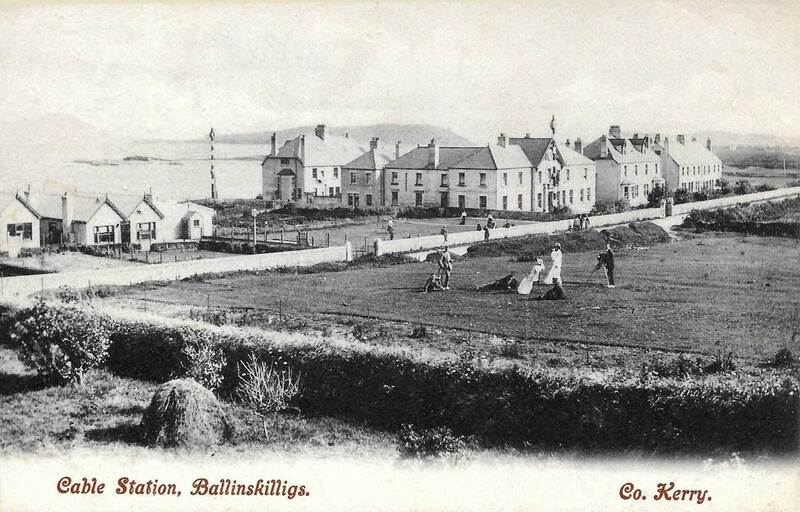 Valentia Island, Ballinskelligs, and Waterville. A tour of the cable station locations and historical sites is a good day out; the sites are all located a short distance from each other on the Ring of Kerry, a 170 kilometer circular route passing through much beautiful scenery from the coast to the mountains, including the National Park at Killarney. 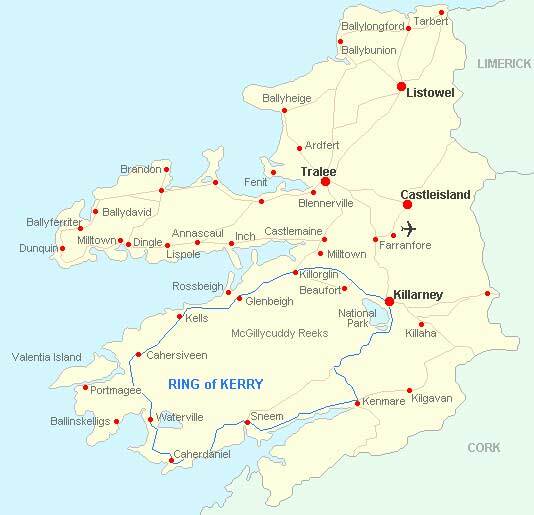 Much useful information on touring the Ring of Kerry may be obtained at the Visitor's Guide website. Driving should not be considered a speedy means of transport in most places in Ireland, and if you plan to travel the entire Ring of Kerry and view all the sights you should allow several days, although the cable part of the route can easily be covered in a day. The cable history is best appreciated by spending at least one night in a most appropriate residence: the Old Cable House Bed & Breakfast at Waterville. This is one of the substantial stone and slate staff buildings constructed by the Commercial Cable Company in 1899, now a comfortable lodging and fine restaurant operated by Margaret and Alan Brown. Margaret Brown is well versed in the cable history of the area, and will be happy to show visitors a number of interesting artifacts, photographs, and documents, as well as providing directions to the various sites. 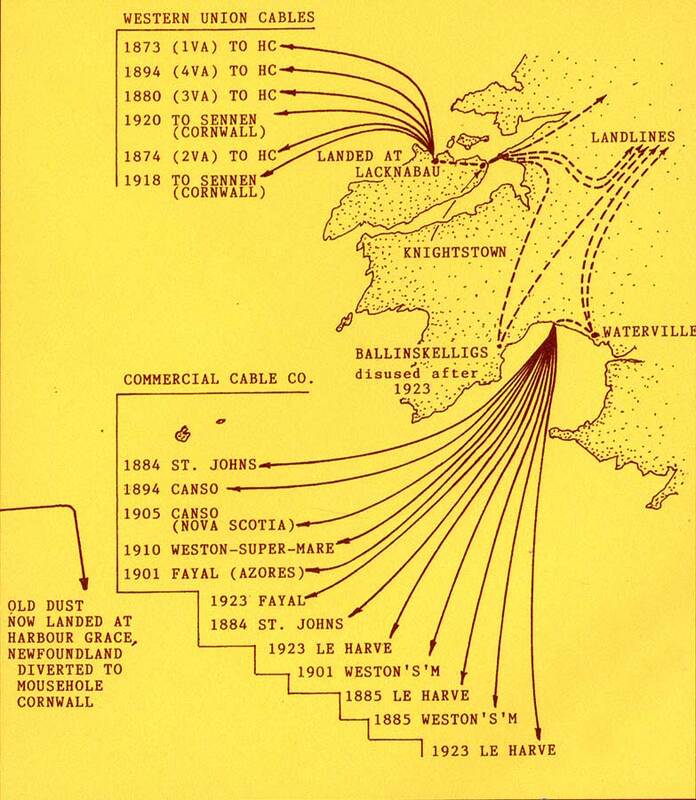 Here I'll present a suggested route for visiting the three cable sites in reverse chronological order, beginning at Waterville and ending at Valentia. 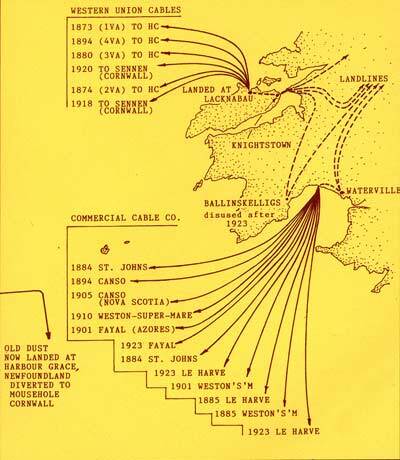 Taking the trail in this order will give the visitor a good impression of the scope of the cable industry, with the last stop being the Valentia Heritage Centre, where the historical displays will help explain the detailed operations. The Ordnance Survey map of the area, Discovery Series 83, will be useful in planning the driving route for the Cable Trail, and is available in the shops in Waterville and other places along the route. 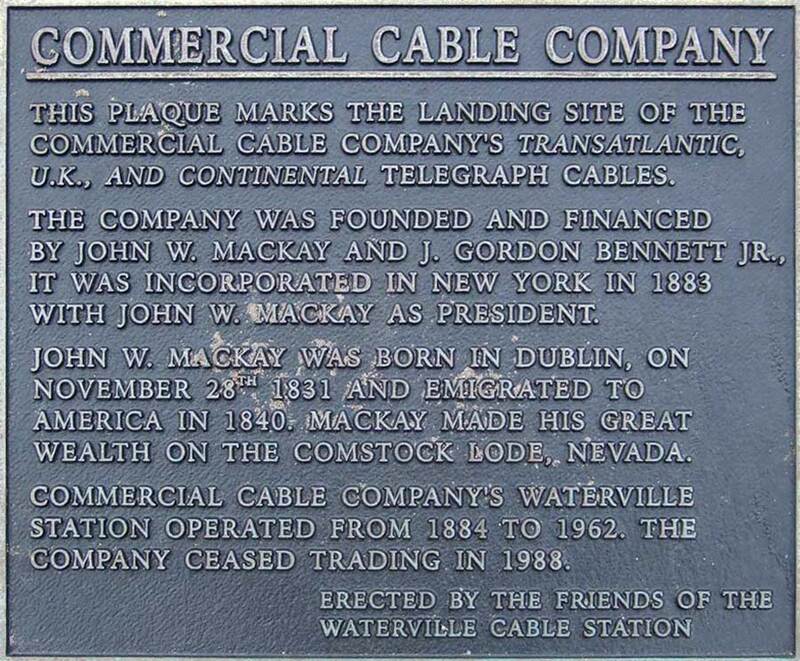 The Waterville cable station was opened in 1884 by the Commercial Cable Company to compete on the Atlantic route with the existing Western Union and Anglo-American cables. For its first premises the company purchased Iveragh Lodge, a former shooting lodge of the Lansdowne Estate at Waterville. This served as the superintendent's residence and cable office, and after being extended was used until 1899, when the new office building was constructed. The cable station employed many staff, and housing was provided for them in a number of handsome stone buildings, one of which is now the Old Cable House B&B. The cable trail begins at the Old Cable House, at the south east corner of the cable station site. Exit the front door, turn right on the road in front of the house, and walk out to the main road. 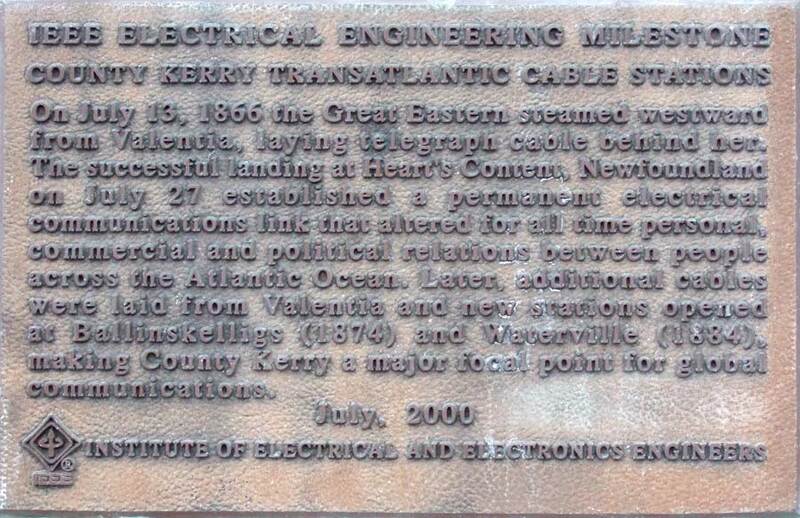 On the gatepost you'll see the IEEE Electrical Engineering Milestone marker, placed in July 2000 in recognition of County Kerry's great significance in the history of world communications. Now retrace your steps and walk past the Old Cable House towards the new cable office, a large stone building with a water pumping tower in the grounds. From here follow the road around to the right, past more houses, until you reach Iveragh Lodge. A plaque on the gatepost gives the history of the building. Walk around to the back of the lodge, then down the alley behind the row of buildings. On the right are the backs of more employee housing. Turn right at the first turn, and walk down towards the shore. At the main N70 road turn left. Cross the street and watch for another historical marker by the side of the road, marking the landing site of the cables. Just before the Huntsman Restaurant turn right on to the path down towards the beach, then walk down the boat ramp onto the beach itself. Here you will see the cable bulkhead, where the cables coming in from across the Atlantic were routed from the beach underground to the cable office. The remains of several cables can be seen, although sadly others have been vandalized. Walk back up the boat ramp, then continue past the Huntsman towards the centre of Waterville. Bear left at the fork, past the row of shops, then bear left again at the next fork and walk up the hill back towards the Old Cable House. on the right, the ocean visible in the distance between the buildings. The Centre is not far from the Old Cable House, and may be located on this map. 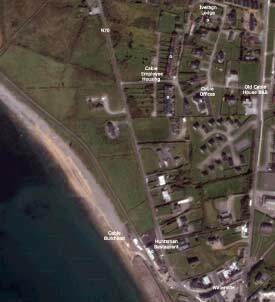 The site of the Ballinskelligs cable station, opened in 1873 by the Direct United States Cable Company, is a short drive from Waterville, although you should be prepared for narrow roads. From the Old Cable House car park turn left on the main road and continue for about 2km until it meets the N70. Go north on the N70 by driving straight ahead at the intersection, and after approximately 2km watch for the R567 on the left. Turn on to the R567, which after about 5km meets the R566. Turn left on the R566 and continue for about 3km to a crossroads. Shortly before the crossroads, on the left hand side, you will pass the site of the Ballinskelligs cable station. 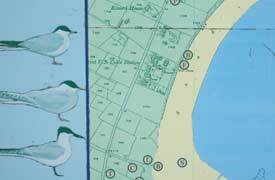 Take the left turn on the single-track road towards the beach, and park near the map signboard. 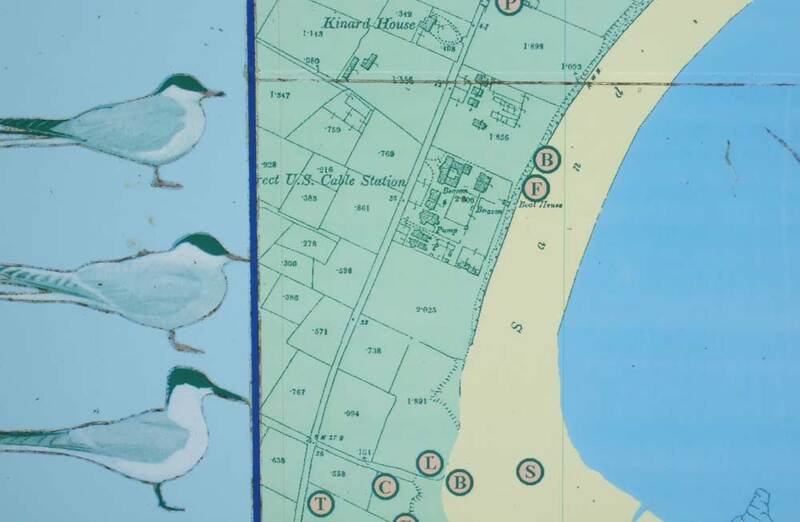 The map shows the location of the cable station, which is a short distance along the beach to the north of the car park, but there is little to see. The shop at the end of the car park has reproductions of early photographs of the area, including some of cable station buildings, and also has for sale the Ordnance Survey map mentioned above. Drive back up from the beach car park, and decide if you want to take the scenic route along the coast and through the hills to Portmagee, or alternatively return to the N70 for the longer inland route (but on better roads) to Portmagee. For the scenic route, continue across the intersection onto the un-numbered road, and follow this for approximately 13km to Portmagee. There are occasional side roads, but the route of the main road is easy to follow. Note that this is a narrow road with sharp bends and some steep hills. For the inland route, turn right at the intersection back onto the R566 and follow this for about 10km to the N70. Continue north on the N70 for 2km and turn left on the R565 for Portmagee (about 10km). Pause for refreshment in Portmagee, then take the R565 across the bridge to Valentia Island. 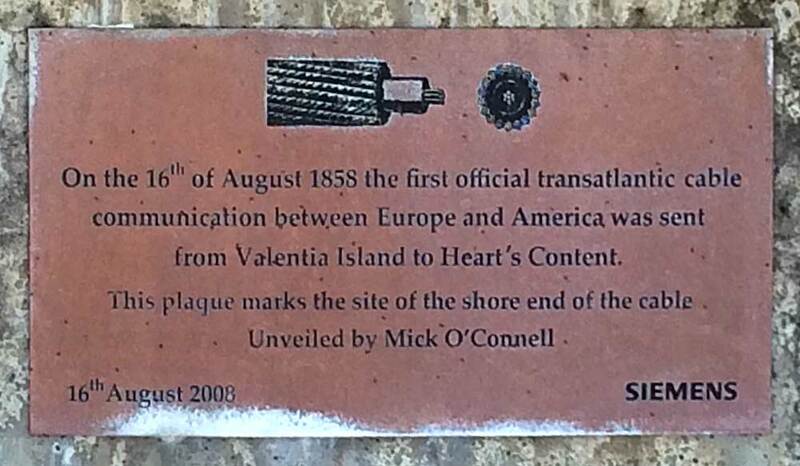 Site of the first attempts at the Atlantic cable laying in 1857 and 1858, and the successful expedition of 1866, Valentia is the location of the oldest Atlantic cable stations in the world. 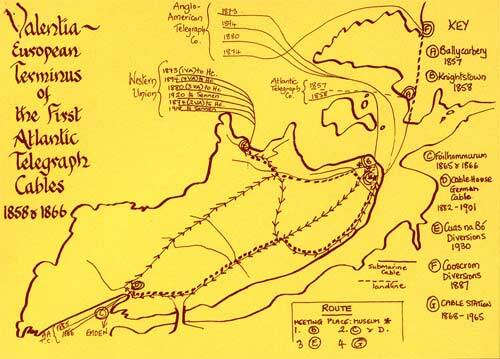 The 1857 and 1858 cables were laid from Ballycarbery on the mainland at Valentia Harbour, while the 1865 and 1866 cables originated at Foilhummerum Bay on the island itself. The first stop is the handsome slate monument on top of the cliffs at Foilhummerum, erected in 2002 to commemorate the many cables laid from Valentia. To reach this, drive up the hill from the bridge on the R565, and instead of following the main road where it turns to the right, turn left onto the un-numbered road. Follow this for just under 2km, and watch for the small parking area on the left just before the monument. From here there is a spectacular view down the cliffs and into the bay, and across to the mainland. Retrace your route back to the main road, and at the intersection continue straight ahead on the R565 towards Knightstown (about 6km). Continue down the main street of Knightstown past the ferry landing and onto the shore road. Watch for the group of white-painted cable station buildings on the right a short distance from the ferry. An IEEE marker identical to that at Waterville can be seen on the gatepost. There is also a plaque on the sea wall near the lifeboat station to mark the landing point of the 1858 cable. This was installed in 2008 to commemorate the 150th anniversary of the landing. This Geograph image of the lifeboat station shows the exact location of the plaque. Retrace your route back into Knightstown, and drive up the hill on the R565. At the top of the hill where the R565 bears to the left, take the right turn on the un-numbered road, which leads to the Valentia Heritage Centre. Watch for the Centre on the right after a short distance, and park on the road. This Google map shows the location of the Heritage Centre, which is the large building on the north side of School Road. At the bottom right of the map may be seen the cable station buildings on Cable Terrace. The Heritage Centre has several rooms of local history displays, one of which is devoted to the cable. There are cable samples, instruments, and other artifacts, and some excellent display boards on the history of Valentia and the cable. See my page on the Heritage Centre for photographs and contact details. 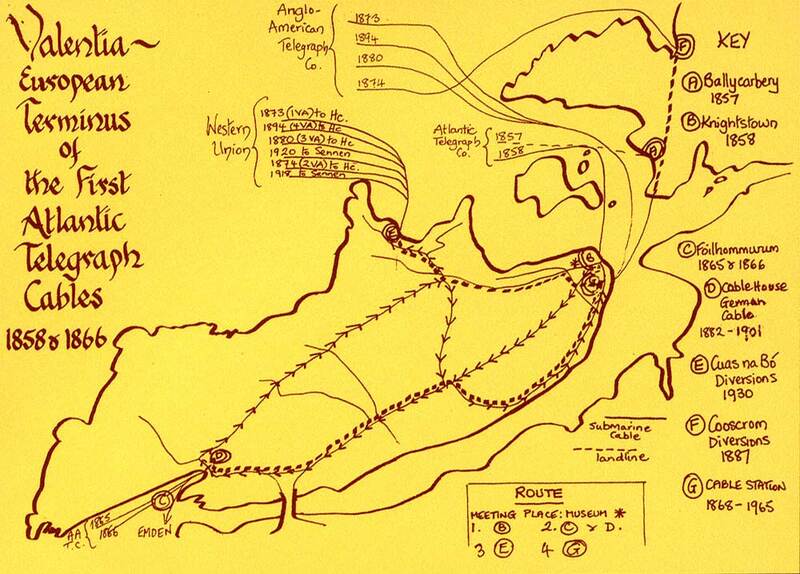 If you wish to visit other cable sites on Valentia (although there is little to see elsewhere), follow the local map. This is the end of the Cable Trail. From the Heritage Centre, turn back and drive once again through Knightstown to the ferry landing. The ferry runs continuously between Knightstown and Reenard Point on the mainland, and the fare is nominal. From Reenard Point drive to the N70 and take this north to Cahersiveen, where there is a good choice of restaurants and pubs for refreshments or a meal. From Cahersiveen you can either return to Waterville on the N70, or continue your journey elsewhere.